Diana McCorry’s debut album entitled “Diana” brings a refreshing new definition to today’s popular song market. On the disc, Diana brings a personality and sophistication to the songs that seem impossible for someone of her tender years. On her debut CD, Diana combines her vocal and dramatic talents with a super jazz ensemble under the direction of producer/guitarist Tony Romano. 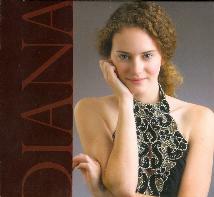 “Diana” features original music and lyrics composed by her father, Tim McCorry. Influenced by Julie London and Billy Holiday’s vocals, the CD, the music and Diana’s voice and phrasing are revolutionizing Jazz Music and the Adult Contemporary markets. Everybody will be talking about Diana McCorry who is emerging in the International Music Market Scenario like a lightning bolt cutting across the dark nighttime sky. The CD’s official release is scheduled for Fall 2008. “Diana” will be heavily promoted through a national radio and press campaign. Upcoming performance dates are in the works. Diana’s crossover style, contemporary in feel and classic in nature, is one that most artists try to achieve. Diana currently studies Drama at the American Academy of Dramatic Arts in New York City. * Your song 'Isn't it lonely without me?' has just been added to Enjoy These Choons station! * Your song 'Isn't it lonely without me?' has just been added to Hidden Gemstones station! * Your song 'Isn't it lonely without me?' has just been added to mAgic aT vEry LEast station! * Your song 'Isn't it lonely without me?' has just been added to KIAC Hitline station! * Your song 'Isn't it lonely without me?' has just been added to A Quiet Ambiance station! * Your song 'Isn't it lonely without me?' has just been added to THE COOL TUNES station! * Your song 'Isn't it lonely without me?' has just been added to The Composers Station station! * Your song 'Isn't it lonely without me?' has just been added to Cashbox On The Radio station! * Your song 'Isn't it lonely without me?' has just been added to RJV007 station! * Your song 'Isn't it lonely without me?' has just been added to Raymond Porters Weekly Playlist station! * Your song 'Isn't it lonely without me?' has just been added to Raymond Porters Top 50 station! * Your song 'Isn't it lonely without me?' has just been added to Raymond Porters New Artist Of The Day station! * Your song 'Isn't it lonely without me?' has just been added to Raymond Porters Track Of The Day station! * Your song 'Isn't it lonely without me?' has just been added to The New Golden Age of Internet Radio station! * Your song 'Isn't it lonely without me?' has just been added to Rays Subterranean 40 station! * Your song 'Isn't it lonely without me?' has just been added to MAKE IT EASY IF YOU PLEASE station! * Your song 'Isn't it lonely without me?' has just been added to The chill out corner station! * Your song 'My apology' has just been added to MY FAVOURITE MISTAKES station! * Your song 'Isn't it lonely without me?' has just been added to AOR (All Over the Road) station! * Your song 'Isn't it lonely without me?' has just been added to AOR Overflow station!